Knight Shift - ZineWiki - the history and culture of zines, independent media and the small press. 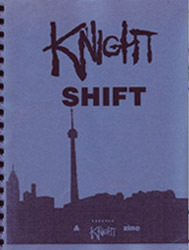 Knight Shift was devoted to the television series Forever Knight. Two issues were published in the 1990s. The first issue of Knight Shift was published in June 1996 and contains 182 pages. It was released as a fund raiser for the DC Children's Hospital. Most of the stories for Knight Shift were written by members of the FKFIC-L fan fiction mailing list. Knight Shift 2 was published in October 1996. It contains 204 pages, and includes the story "Grace" by Maureen Wynn that won a FanQ award for Best Forever Knight fiction for 1997. Knight Shift is included in the Special Collections of the University of Iowa Wathne Fanzine Archives Collection. This page was last modified on 22 January 2019, at 12:05.